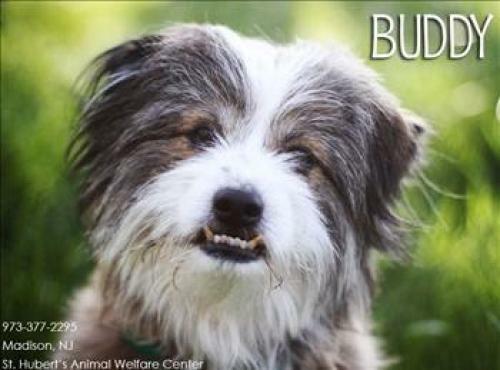 To Dog With Love: Maddie's Pet Adoption Days Comes to NYC for Free Pet Adoption Weekend! 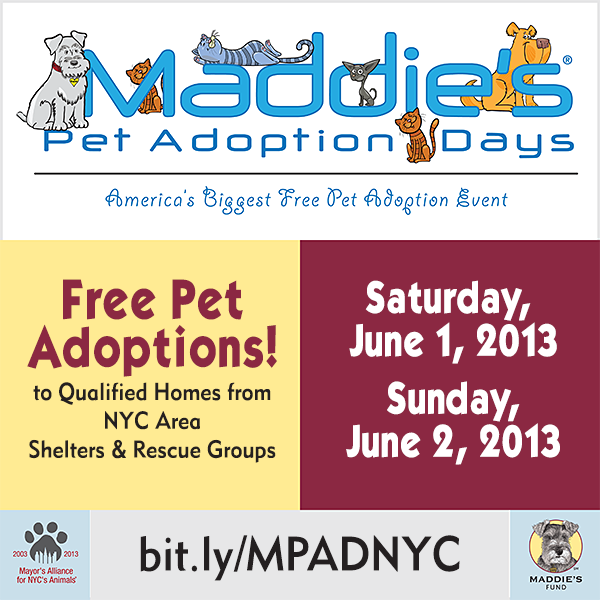 Maddie's Pet Adoption Days Comes to NYC for Free Pet Adoption Weekend! Here's a great opportunity for our NYC pals who are thinking about adopting a pet. If you're looking to find your forever kitty or dog pal, there's no better time than the weekend of June 1-2. 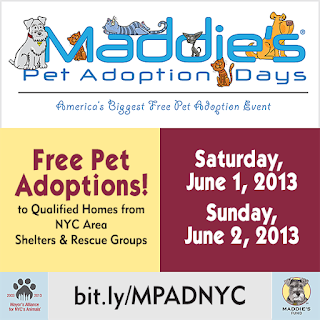 That's because, for the first time, Maddie's Pet Adoption Days is coming to NYC! Maddie's Pet Adoption Day, the biggest free pet adoption event in America, is going national this year and the Mayor's Alliance for NYC's Animals is leading the charge in New York City! 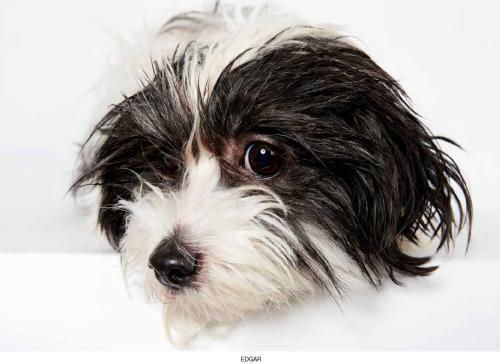 Mayor’s Alliance hopes to place hundreds of dogs and cats in qualified forever homes in the New York City Area on June 1 & 2. Free adoptions for qualified adopters will be offered throughout the weekend at participating shelters and other adoption locations, and at two large, outdoor adoption events in Manhattan. Here are a couple of the cuties available for adoption in the NYC area! The goal of Maddie's Pet Adoption Days is to give all healthy, senior and treatable shelter dogs and cats a second chance. As in past years, adoptions of dogs and cats will be free to qualified adopters. In return, Maddie's Fund has set aside $4 million so that it can give each shelter or rescue group $500 - $2,000 per adoption. The adoption event honors the memory of the foundation's namesake, a Miniature Schnauzer named Maddie, who was lovingly owned by PeopleSoft founder Dave Duffield and his wife Cheryl. Dave promised Maddie that if his company ever made some money, he would help other cats and dogs so that their families could be as happy as they were with Maddie. Since then, Dave and Cheryl have endowed Maddie's Fund with more than $300 million to help shelter cats and dogs find new, loving homes. Maddie's Fund expanded this year's event to include adoption sites across the U.S. because of the continued success of Maddie's Pet Adoption Days on a local level. Every year, the number of adoptions has increased with a total of 6,722 dogs and cats adopted during the event's three-year history. This year, the hope is to adopt 5,000 animals during the two-day event by expanding the geographical boundaries to reach 11 million more people. 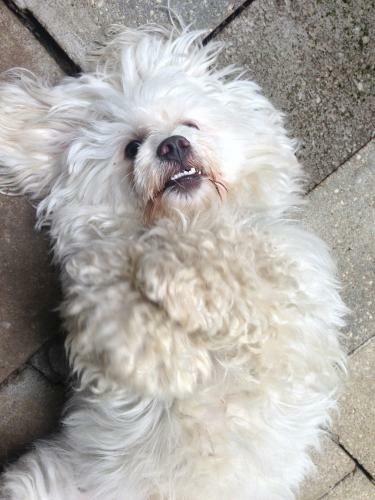 To see other cities participating in Maddie's Pet Adoption Days click here. This is a sponsored post but the opinions reflected herein are my own. Maddie's Fund is amazing, thanks for sharing!